Repeats every week every Tuesday until Wed Dec 19 2018. Also includes Tue Jan 08 2019, Tue Jan 22 2019, Tue Feb 12 2019, Tue Feb 26 2019, Tue Mar 12 2019, Tue Mar 26 2019, Tue Apr 09 2019, Tue Apr 23 2019. 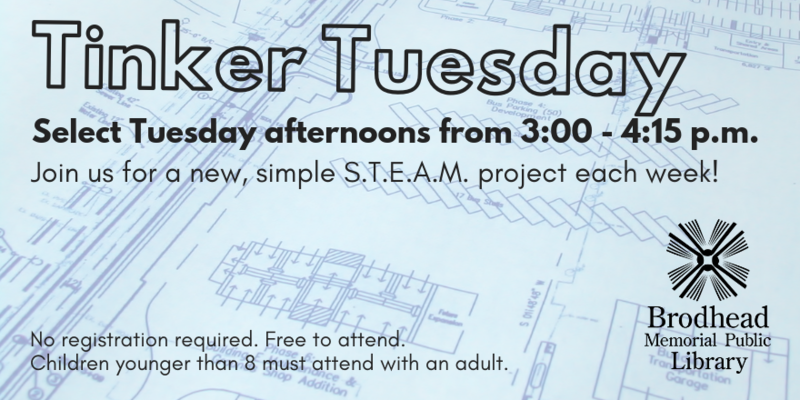 Join us for Tinker Tuesday, our new after-school S.T.E.A.M. (science, technology, engineering, art, and math) program! Each week we'll create a simple project and learn how it works! Check the library's Facebook page to see the weekly project. This program is geared toward elementary school-aged children. Children younger than 8 must attend with an adult. This program is free and all supplies will be provided.